The killing of thousands of stray dogs in Romania since 2001 takes place on the basis of a national law, duly approved by the Romanian Parliament. The approval of this law has been possible because it has never been approved at European level a Directive which prohibits the EU member states to manage with these methods the pets “in excess”. 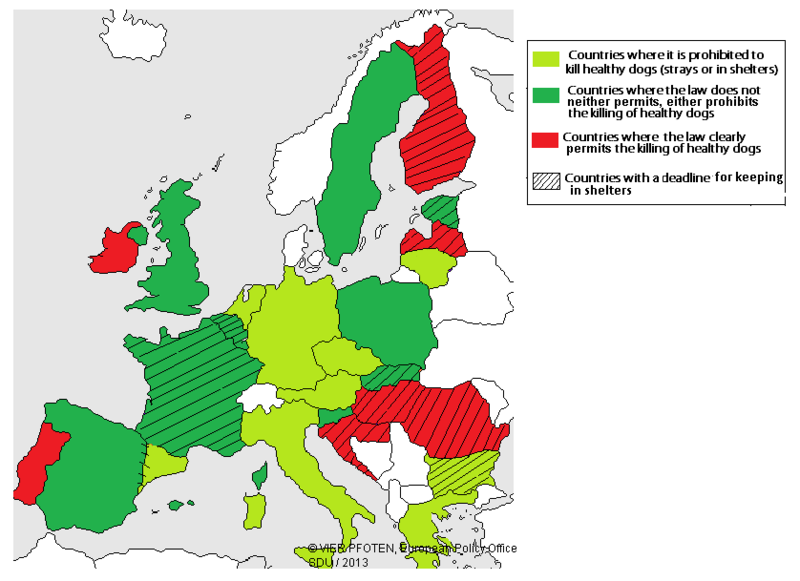 The use of euthanasia (even if in Romania we talk about real “killing”) as a tool to contain the canine and feline population is unfortunately widespread even among other European countries, despite the fact that the stray dogs issue is very different throughout the continent and in some cases does not exist at all. The map helps to understand the patchy picture of the situation and the need for a legislative harmonization in the EU, very difficult to obtain since pets have always been considered a topic related to the culture and traditions of each people, an irrelevant issue from an economic and health point of view. For this reason the answer from Brussels to the million of signatures and letters sent in recent years asking to stop massacres such as that in Romania has always been: “This is not a matter of our competence”. We are not afraid to say that the technicians in Brussels made a manifest error of assessment, given the outburst of the trade of purebred puppies (from East to West), which has consequences both economically and sanitarily. Moreover the stray phenomenon itself (where it is endemic, as in Romania) represents a risk for the public health with significant social and health costs, that cannot be ignored by the institutions. For some time, therefore, many associations started a patient lobbying, pressuring the European Parliament and Commission to develop a legal framework with guidelines for the member countries that ensure better protection for dogs and cats in the EU. Save the Dogs does not have the resources to hire a full-time lobbyist working in Brussels and Strasbourg. Yet through direct activities of its president and by participating in a European network launched in 2014 by Dogs Trust (the EU Dog & Cat Alliance), Save the Dogs has been committed in recent years to lobby and influence the European “decision makers”. On Tuesday 20 November 2018 the premiere of the documentary “A dog’s life – The homeless dogs of Romania” was held at the European Parliament in Brussels. 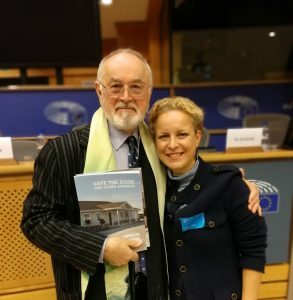 The event was hosted by MEP Stefan Eck and co-organised by the Intergroup for the Welfare and Conservation of Animals and Eurogroup for Animals. The initiative was attended by some of the most active animal welfare associations in Romania, like FPCC and Millions of Friends, and many charities from the UK. On the other hand, the presence of MEPs was extremely scarce and no Romanian MEP accepted the invitation to participate. To be noticed was the presence of two officials of the High Representation of the Romanian Government at the European Parliament, who certainly reported the contents of the initiative to the relevant Ministries. At the end of the debate they claimed that “the Government is respectful and interested in NGOs work”, while everybody knows that the cry of thousands of Romanians and European citizens against the public kennels remains unheard and no petition or public initiative seems to affect the rulers of Romania. And the cull goes on.